Object This article describes a method for automated extraction of branching structures in three dimensional (3D) medical images. Materials and methods The algorithm recursively tracks branches and detects bifurcations by analyzing the binary connected components on the surface of a sphere that moves along the vessels. Local segmentation within the sphere is performed using a clustering algorithm based on both geometric and intensity information. It minimizes a combination of the intra-class intensity variances and of the inertia moment of the “vessel” class, which emphasizes the cylindrical structures. 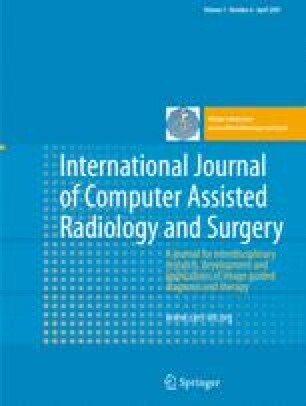 The algorithm was applied to 16 MRA and 12 CTA 3D images of different anatomic regions. Its capability of extracting all the branches and avoiding spurious detections was evaluated by comparing the number of extracted branches with the number of branches found by visual inspection of the datasets. Its reproducibility and sensitivity to parameter variation were also assessed. Results With a fixed parameter setting, 68 out of 286 perceptible branches were missed or partly extracted and 11 spurious branches were obtained. Increasing the weight of the geometric criterion helped in tracking the principal branches in noisy data but increased the number of missed branches. Processing time was within 5 min per dataset. Conclusion From one initial point, the algorithm extracts a vascular tree where the differences of size and of intensity between the branches are not large. Missed sub-trees can be recovered using additional starting points.